“I cried the first time my mother wore a dress I made. She will always be my eternal muse,” shared Randy Ortiz. “She made me who I am today. She is the ultimate inspiration in my life and career.” He is sitting behind the desk in his Quezon City workspace. 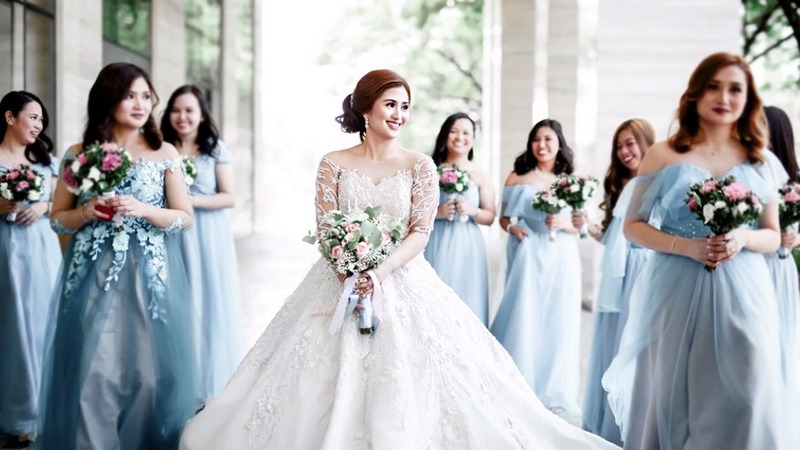 The Manila-based designer was born in South Cotabato, Mindanao to a politician father and a mother who was a fashion icon in the eyes of her son. “I was my mom’s bodyguard. I would go with her to visit all the best fashion designers, where she would have ternos, dresses, bags and shoes made. You could call her a fashionista of her time. My dad, too! I loved how they always matched,” Randy pointed to black-and-white photographs on the wall that captured his parents’ undeniable style. He loved fashion even at a young age and admits spending all his allowance on having designers make his clothes. However, when it was time to move to Manila for college, he opted to take a Hotel & Restaurant Management course in De La Salle University. “Tourism was booming at that time. I wanted to get into that business because I wanted to travel and eat. It was a shortcut in life, and it was all about being independent from your parents right away. No one during that time would think, ‘Hey, I’ll become a fashion designer.’” Nevertheless, the penchant for fashion remained. After a short stint working for a food company called Pandesal Magic, the boy from Cotabato decided to try his hand in the rag trade. After honing his sewing skills, Randy was confident enough to join a few shows. His first show was staged at the Ateneo De Manila University in 1988, where students of the college modeled for him. He also participated in Rico and Tina Ocampo’s Sari Sari, the biggest retail show in Manila at that time, alongside then-starting designers and brands such as Vic Barba, Rafe Totengco, Kamiseta and Bayo. When he wasn’t preparing for a show, Randy admitted to hustling his friends. “I would go to people with my clothes. I would put it in my trunk and drive to my friends’ offices. I would always sell out because they would buy, then they would tell their families about me,” he laughs. Thirty years later, Randy has remained one of the country’s top designers. Manila’s fashion lovers continue to beat a path to his door for his timeless, wearable, and romantic designs. “I’m classic but with the edge,” he smiles. He has had several collaborations, opened a ready-to-wear shop called Myth a few years back in Greenbelt 5, was president of the country’s Fashion & Design Council (founded by Josie Natori and Inno Sotto) for five years, and has done partnerships with local brands like Bench and Kashieca. His last big show was in 2017, when he prepared a Philippine Design collection for the women of ASEAN. Working from two offices, Randy finds work-life integration very important. “It takes sheer discipline to balance your personal life and work. One is never above the other. If you sacrifice one for the other, you will not prosper in business. “Before, I used to be a very early person. I would wake up and see clients at 7AM, even if I still smelled like vodka from the night before! But a few years ago, I began to show some restraint. I enjoy my sweet time now since I think I’ve reached a certain stature,” he says. Randy wakes up around 9AM every day and relaxes in bed for another half hour before he finally gets up and goes to work. He splits his days between his shop in Quezon City and his satellite headquarters at his home in Makati. Lunch and dinner are often spent with family and friends before he makes time for cardio exercise like Zumba. Randy also considers himself lucky to have his brother by his side, who handles most of the business side of the company. Although he is no longer selling clothes out of the trunk of his car, Randy has never changed as a person. He is still that boy from Cotabato with big dreams. He just happens to be living that dream and he’s grateful everyday. Read the full cover story of Randy Ortiz in Lifestyle Asia’s December-January 2018 Edition, titled the Celebrations Issue. Run to the nearest bookstore for your print copy or download the FLIP100 app for a digital version.